Checkpoint. System Design Guidance. More about view model classes. Design model classes. AutoMapper. More HTML Form elements. Quiz 2 is today. We will probably do it at the end of the timeslot, beginning at 9:30am. We have completed two full weeks of the course. Some of the topics are familiar, but many are new. Let’s pause for a few minutes, and make sure that you have a good foundation.In this brief discussion, we’ll cover the important topics and concepts. If you have a question, please ask. >>> You must be comfortable with the structure and coding approach for an ASP.NET MVC web app. Controllers, view models, and the Manager class are located in the Controllers folder. The Views folder holds user interface code. Do you have any questions about this? >>> Many ASP.NET MVC conventions should be starting to be familiar, including naming conventions, singular and plural usage, route selection, and so on. Are you familiar with these topics? >>> Comfort with collections and LINQ is important. How well are you learning these topics? >>> Delivering content to the user (on a view) is a critical skill to have. Do you know how? >>> Equally important, you must be able to get user data into your app. We will use a strongly typed view model object to describe the shape of the incoming data. This briefly describes the journey we will take through this week’s topics. The System Design Guidance diagram will help us to write a larger and more complex app. You will learn to take advantage of a “layered” architecture, to separate our concerns, and enjoy many other benefits. More work on user interface components, especially lists. Improving the quality of the incoming data. In semester 4, we begin to use a worksheet named “System Design Guidance”, to help you begin the process of writing larger and more complex apps. It presents a “layered” architecture, and you learn where to locate your source code modules within the architecture. The worksheet is introduced and discussed today. You can begin implementing its ‘best practice’ principles in your work right away. You have learned that a view model class takes on the exact shape of the data you wish to work with in a view. What classes do you write? The answer is totally and completely dependent upon your app’s use cases. However, there are some common and obvious use case patterns. Follow these suggestions as you write view model classes for your first few apps. As just stated above, assume a “Suppliers and Products” domain model. A supplier can have zero or more products, and a product is always linked to one supplier. Notice the use of the entity’s name in the classes. Notice also the inheritance chain. You do not have to write all these classes. Conversely, you may need more classes to handle some use cases. Don’t be afraid of doing that. Above, you were reminded that a view model class takes on the exact shape of the data you wish to work with in a view. In your project’s “Models” folder, create a source code file named “DesignModelClasses.cs”. This will hold one or more classes that describe real-world entities. The controllers (and views) will NEVER have direct access to these classes. 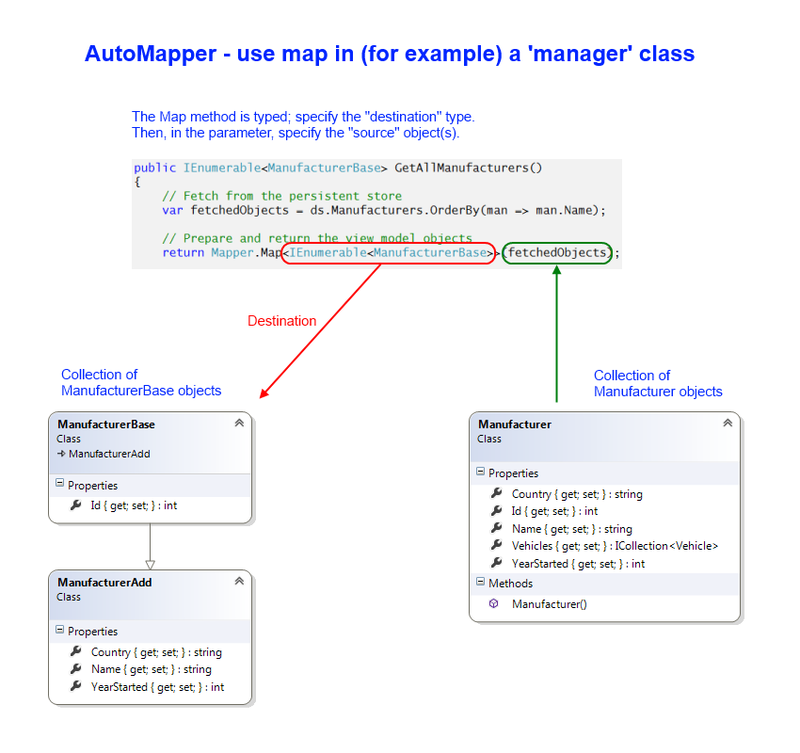 The “Manager” class will have access to the design model classes, and convert (or “map”) a design model object (or collection) to-and-from a view model object (or collection). The design model class name for a supplier entity is Supplier. Singular. Similarly, the design model class name for a product entity is Product. Singular. If you have five properties, you will have five property-setting statements. If you have twenty-five properties, you will have twenty-five property setting statements. Oh. Will it be fun to write that code? So, converting (or “mapping”) between classes is tedious. Boring. Error-prone. Ugly. Awful. How do you add AutoMapper to your app? Via NuGet: In Solution Explorer, right-click your project, and choose “Manage NuGet Packages”. A dialog appears. In the left-side navigator, click/select “Online”. In the upper-right “search” area, enter (and look for) “automapper”. The search results appear in a list in the middle panel. Click/select the AutoMapper item, and click the “Install” button. This action will copy the AutoMapper library to your “packages” folder, and update your project’s “packages.config” source code file. Now it’s ready to use anywhere, simply by adding a “using AutoMapper;” directive to any source code class file. The best practice way to configure and use AutoMapper is described next. The CreateMap method defines a mapping relationship between two classes. The first parameter is the “source” class. The second parameter is the “destination” class. For each use case and its view model class, create a map, from a design model class, to the custom-and-specific view model class that will service that use case. Typically, you will have maps that “shape” the delivery of data to the view. Also, you will have maps that enable a view to “add” or “update” items. 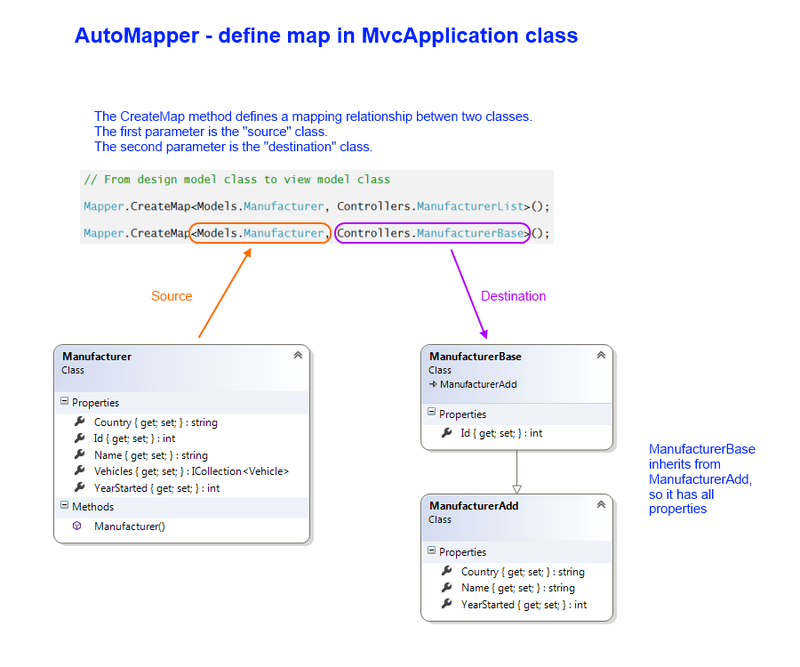 Occasionally, you can even map between view model classes, where both the source and destination is a view model class. You will see that in the “Cars” web app code example, in the controller method that handles the creation of a new vehicle. There’s a mapping between a “VehicleAdd” class and a “VehicleAddForm” class. Very convenient. After the maps have been defined you can use the Mapper.Map<T>() method anywhere you need to (e.g. in a Manager class, or in a controller method). Sources and destinations can be an object, or a collection of objects. One statement replaces several. What a deal.